Star Trek directed by J.J. Abrams marks the return of one of the most beloved and cherished franchises in entertainment history. Not only is it a successful return, it also invigorates and reinvents the franchise to heights never imagined. The film works as a pure summer action film, as well as makes a significant contribution to the Star Trek Universe. Let's first acknowledge that fans of the Star Trek Universe are notoriously fickle. There is a significant population of fans who frown on the very notion of disregarding or altering the continuation of Gene Roddenberry's created universe. 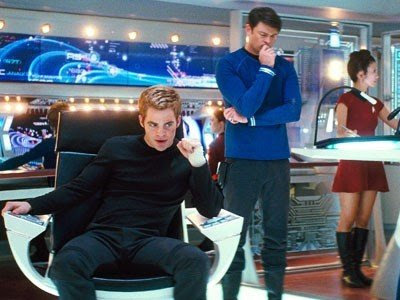 The television show Enterprise was never fully embraced by fans because it was burdened with and failed to accurately depict the continuity of the earlier established Star Trek universe. Never mind that the task is arguably impossible considering that the fictional universe was molded by at least five different shows and several films all with different writers, producers and creative visions. Enter J.J. Abrams who attempted to reinvigorate the Mission Impossible franchise. He was tasked with doing the same with this troubled franchise which was at its best seen as an archaic niche fetish for sci-fi fans and at its worst...dead. Before I begin my actual review let me first state that I am a Star Trek fan. Actually, fan is not accurate. I'm a Treker. I've never been to a convention, have never worn a costume or pointed ears. But in terms of information and trivia, my Star Trek knowledge, especially of the original series can stack up comparably to most of the people that do take their appreciation for the show to the extreme. I know that in the opening credits of the series the titles were yellow in the first two seasons and in the third they turned blue. I know Pavel Chekhov doesn't appear in the series till the second season. Harcourt Mudd appears in two episodes in the original series. 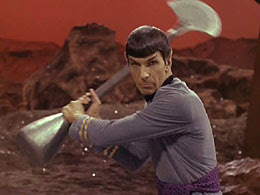 #4: "The Menagerie" parts 1 and 2 - the original Star Trek Pilot altered into two episodes. And my #1 favorite episode is "Amok Time" which featured a hand to hand fight between James T. Kirk and a unbalanced Mr. Spock in heat. I used to record the series on betamax tapes and fall asleep watching them...um...every night. I bought and read Star Trek encyclopedias and reference books on the series. I collected the episodes on tape and cataloged them in my own system. I've seen every original cast and Star Trek Next Generation episode and movie. I love Star Trek. Despite all its faults. So if anyone has a right to nitpick about a reboot it's me. But I can't. I loved this movie. Not only did I love it, I think the changes that were made actually improve the franchise. In all honesty, I will admit, the movie owes more of its inspiration to the recent "Battlestar Galactica" series then to the original 1960's series. However, the movie doesn't completely neglect the major characteristics of the original universe either.Captain Pike is still the previous Captain to the Enterprise. All the major characters are present. They all still say their famous catch phrases and they all look relatively similar to the original cast members. Starfleet is still a peace keeping and scientific organization. Kirk still cheats in the Kobayashi Maru test. The Enterprise hull still looks the same. But make no mistake about it. There are several significant changes. Ultimately, I think the alterations that were made are not only re-invigorating but also logical. Beginning with the death of Kirk's father. Raised as a fatherless child, James T. Kirk now has a lethal chip on his shoulder. Next, the sexual relationship between Uhura and Spock. What a stroke of genius. I'm not sure why it never occurred to previous writers, but in retrospect this seems like a no-brainer. Spock is half human. His mother, the most significant female in his life IS human. Wouldn't it make sense that he would be attracted to a talented, strong HUMAN woman like Uhura? I know in the original series they flirted with the idea of Nurse Chapel liking Spock. But wouldn't Spock only go for the hottest chick in the fleet? Another major change, Vulcan is destroyed. Wow. So the most cherished characters in the Star Trek Universe have now become endangered and are now...in this timeline more important, revered and valuable to Starfleet than ever before. But the most significant and freeing move is that due to the time travel plot of the film, the rules and the universe that was previously created by the previous movies, shows, etc are now smashed in this new timeline. It's an open book now. A clean slate. Literally...anything can happen. In terms of artistic possibilities, that's the greatest thing you can do with a franchise. But J.J. Abrams and screenwriters Roberto Orci and Alex Kurtzman pulled it off. They have delivered the best movie of the summer. Possibly one of the best movies of the year. 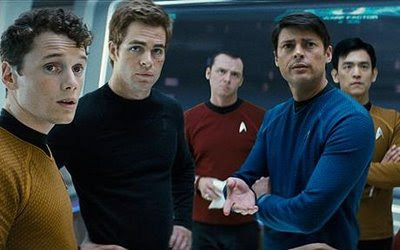 I guess an argument can be made that this movie may invalidate the previous Star Trek universe. But I don't look at it like that. It's an extension. A next step in the evolution. A part of me wonders why they even bothered to connect the two universes. Abrams could have easily just rebooted the franchise without any acknowledgment of the Star Trek Universe. But when you really break it down, I believe because he respects the material that has come before it so much, he actually goes out of his way to connect the two universes. Despite all its problems, he is in actuality paying tribute to the previous universe not invalidating it. He cares too much to just throw it all away and start from scratch. Make sure to catch this fun film on the big screen where it can be seen in all its visual splendor. You won't regret it.